How to Help - WHAT IS SAS? There are still a limited amount of individuals that have been diagnosed with SATB2-associated syndrome (SAS). For this reason, several questions remain unanswered. Dr. Zarate has started a project with a clinical database where information on all cases caused by deletions, duplications or mutations in the SATB2 gene is compiled together. Dr. Zarate also works closely with Dr. Jennifer Fish, Assistant Professor at the University of Massachusetts Lowell. Dr. Fish has an interest in developmental biology. Research in her lab focuses on the development of skeletal structures, especially the skull and limbs. Dr. Fish’s lab is currently studying how mutations in the gene SATB2 affect skeletal development. A primary goal of this research is to understand why patients that are affected by the same disease (for example, SATB2-Associated Syndrome) often have differences in the type or severity of skeletal defects. In collaboration with Dr. Zarate, Dr. Fish and her research team are also working to understand if different types of mutations in the SATB2 gene are associated with different disease outcomes. This research uses animal models and cell culture systems to better understand how mutations in SATB2 affect bone development. Figure 1. microCT scan on a 10 day old mouse skull from a Satb2 heterozygote. Lower jaw is small and it doesn’t extend to the maxillary incisors. Figure 2. 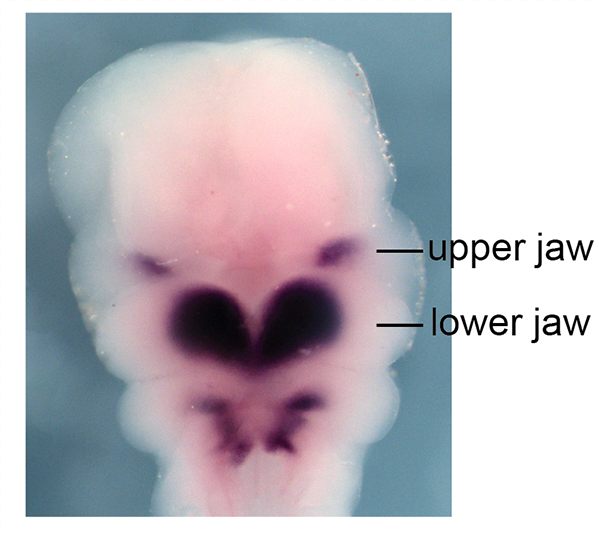 E10.5 mouse embryo showing Satb2 expression in the developing jaw. If you are a patient/relative or a physician taking care of a patient with SAS, please contact Dr. Zarate for further details.